It's a week full of pretty things. Today, pretty spring looks from Celine. I love the leather, especially in the top two images. What would you call that color? 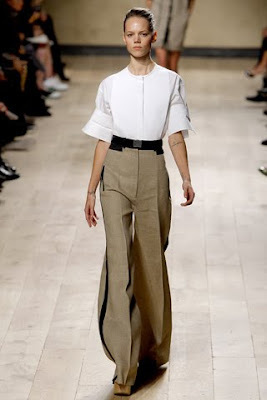 And I love the wide leg pant. They should never be considered out of style. The shoes? Umm, I could do without. I'd call it mustard gold. I die!!! Want the shoes and the black skirt! !